On December 1 1918, the National Assembly of Romanians of Transylvania and Hungary, consisting of representatives of the Romanians in Transylvania, Banat, Crişana, Satmar and Maramureş, convened in Alba Iulia, decreed "the unification of those Romanians and of all the territories inhabited by them with Romania". 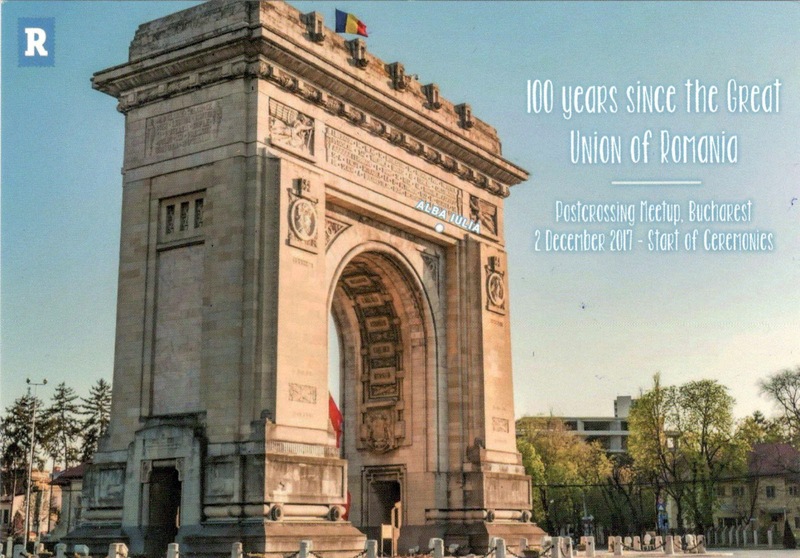 Since 1990, the Great Union Day (which marks the unification not only of the mentioned regions, but also of Bessarabia and Bukovina with the Romanian Kingdom) was established as the National Holiday of Romania. As a result, on December 1, 2018 will be celebrated the centenary of the Great Union, so practically the 100th year began on December 2, 2017. On this occasion the Romanian postcrossers organized a new meetup, on the initiative of the tireless Mihnea Răducu, who also edited a special postcard, representing the Arch of Triumph, located in the northern part of Bucharest, on the Kiseleff Road. Presently, military parades are held beneath the arch each December 1. The first, wooden, triumphal arch was built hurriedly, after Romania gained its independence (1878). Because also the 1918 arch had been built from a material that doesn't withstand the rains, in 1922, in the context of the crowning of King Ferdinand I and Queen Maria as sovereigns of Great Romania, was hired the architect Petre Antonescu to build an imposing monument. Again the time was short, and only the skeleton of the construction was poured into reinforced concrete, the bas-reliefs being made of plaster, which led to a progressive degradation, the arch reaching in the early 1930s a ruin. In 1932, the deplorable situation of the arch returned to attention, deciding not to demolish it, but to replace the stucco bas-reliefs with some of Ruşchiţa marble. This time, Petre Antonescu gave the edifice a much more sober note regarding the exterior finish, made by artists known in the interwar period. The population, especially the numerous associations of the former WWI combatants, contributed over 7 million lei to the building of the arch. Once the necessary sums were gathered, the year 1936 was fully devoted to the completion of the monument, which was built from the Deva granite in the classical style, following the model of the Arc de Triomphe in Paris. Its shape is that of a parallelepiped, having a foundation of 25 × 11.5m and a height of 27m. The pillars have interior stairs that lead to its terrace. The inauguration ceremony took place on 1 December 1936, when were celebrated 18 years since the Great Union. The Arc de Triomphe houses a small museum, which can be visited only on special occasions. The first stamp is part of the series Flora from Protected Areas - The Rodna Mountains, designed by Mihai and Vlad Vămăşescu and issued on March 28, 2009. The last stamp is part of the series Romanian Pottery, about which I wrote here. 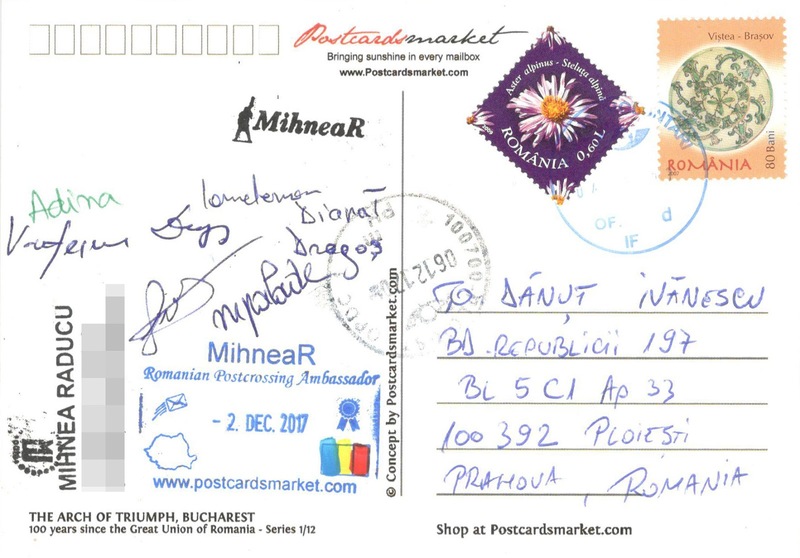 Sender: Mihnea Răducu and the Romanian postcrossers who participated to the Postcrossing Meetup which held in Bucharest on December 2, 2017. Cărți poștale maxime cu păsările naționale ale României.